32 St. John's Place, in the Allentown Historic District one block south of Symphony Circle, is a robust example of the shingle style at its best. A tenant with friends in low places attracted an arsonist who set the front porch on fire, which spread into a wall cavity to the roof. Yet the house is structurally sound and has grand interior spaces and a wonderful chamfered brick chimney which rises from a rusticated Medina sandstone base. The city now owns the building and is looking for a sympathetic owner with the capital to renovate. The Coalition would help clear out the Interior so the house could be sealed and worked on over the winter. View a picture of it on our Webslte or go over for a look. In December 2001, this dwelling is a rooming house, but this monstrously large black shingle style home was once the home of Howard Bryant, a writer for the Buffalo Evening News. J. W. Byers purchased the lot on St. John's Place 210 feet east of Orton Place from Annette Hersee in May of 1886 for the sum of $2,625. He probably intented to build a home for speculative resale. However Jennie D. Bryant (Howard's wife) purchased the lot the following March from J. W. Byers and his wife Olivia on March 3, 1887 for the sum of $3,325; its price would suggest that it was unimproved at the time of its sale. Bryant probably had another designer and builder construct the home. The home features a front porch with short clustered Doric columns that support round and segmental arched with saw-tooth edging and a shed style roof. The hipped dormer on the third floor shelters a recessed porch with paneled balustrade and french style windows. In 1900 William R. McNiven (born November, 1856) formerly of 69 The Circle lived in this home along with his wife Jennie (Howard's widow born April, 1860). 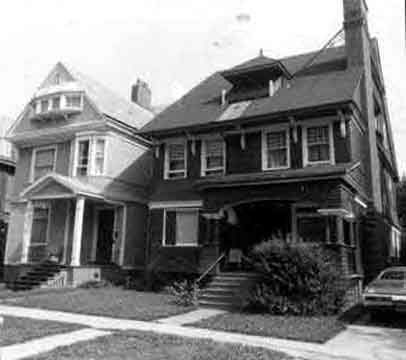 Also living in the house was Jeanette B. Bryant (born January, 1882) and Agnes S. McNiven (born July, 1891). Buffalo City Atlases, 1854, 1866, 1872, 1884, 1891, 1894. Liber 508, p. 179, May 27, 1886. Annette Hersee to J. W. Byers. Liber 509, p. 619, March 3, 1887. Byers to Jennie Bryant. Special thanks to Chris Brown for sharing his research.